Though in a way you're right, they're not "good" according to regular comics stuff - perhaps their affinity to networked conversations is what makes them work? Cos they obviously work for lots of people. I know I enjoy the tiny changes in expressions that you do. Looking at the iChat screen, where there are NO changes in expressions, I think perhaps that the tiny expression changes you do are just enough to make that kind of online chat feeling ever-so-much-more "human". I saw a demo once of a chat system where your photo is actually a kind of a collection of 16 different expressions, so that when you do a :) your smile expression shows, and typing is shown as a mouth opening and shutting and so on. In the prototype it actually looked surprisingly realistic. I like the subtle changes in your dialogues better though. Wonder whether that'd be transferrable to iChat or something? This is all very interesting. I hadn't thought about the parallels to chat before but Jill is right on the mark. These ant/girl dialogues are much more like chat than like a comic- albiet a very constructed, formal, pre-scripted chat. It's also made me think about the iconic nature of the illustrations. They are more like symbols (avatars even?) than characters in a comic. This all ties in very nicely with Mark Bernstein's paper which I read last night. It's amazing when you read something that really clicks with what you've been thinking and also helps you to understand other things you hadn't realised before. Just amazing. Nerd that I am, I was very excited by it. I'm actually looking forward to having a clear weekend to sit at my desk and work, especially as Thieu is on night shifts for the next few days. Torill Mortensen is so right about Anne Galloway's site. I had a printing frenzy when I went there. I love the layout too- so understated and well-organised. I bet she never wears mismatched socks. And she likes miniature machines. It's our mother's birthday today. She is currently in Sarawak, being a Frontier Librarian. 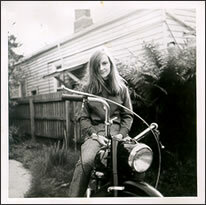 I found this photo of her in 1971, sitting on our dad's BSA when I was doing some heavy-duty procrastination on the weekend. I have a large number of wooden boxes in my bedroom that are like time capsules- containing all kinds of odds and ends gathered at various stages of my life. Sorting through them is like working on an archaelogical dig. I love this picture of my mum- she looks so hip. Hard to believe she was already a mother when it was taken. Thieu was impressed by the BSA. So I hope she has a wonderful birthday and that the Right Foot has a chilled glass of Wolf Blass waiting for her on her return. Do they sing 'happy birthday" in Borneo, I wonder? Lots of great information on Jill's site today- and it's so great to get feeback as you are working on things. I had a look at Mark Bernstein's piece and also tried the link he provided in the comments but I haven't looked at this properly yet (o, but I will). I like the title of Jill's post: ways of writing and defining and thinking because this sums up some things I've been skirting around with my thinking on this project- that there are a multiplicity of ways of doing these things and I think I'm interested in the workings rather than the smoothed out finished piece. I think that the Questioning Ant conversations will have to figure in the final piece I produce (and what exactly will that be" I hear the Ant ask)- they have started to become integral. It surprises me that people like them, and as far as comics go, they are pretty dodgy (waaaaaay too much dialogue.) But unless everyone is lying to me, they seem to strike a chord with some people and this, obviously, is delightful, especially as I really only started doing it as a way of spelling things out to myself in a really simple way. More characters? Yes, definitely. I tried one where I used my sister but I felt that I was on dodgy territory here- it's one thing to ficitonalise your own life, but to drag someone else into it is probably not nice. I just did a really long post with lots of links and then I forgot to close some stupid bracket and ended up with what's below. Fixed, thanks to Sensei, Nov 16th. Of course, now the entries double-up, but for the sake of blog purity, I shall leave both intact. Some great information from Jill Walker's site today, so incredibly useful to have feeback on things as I'm working on them. (mental note: I wonder if I can get Jill as an examiner for my MA?) In the coincidental way that these things happen, I was actually looking at Understanding Comics in a bookshop last night. Scott Mccloud's site is well worth a visit, too. It was Understanding Comics that made me realise how useful the comic format could be for conveying ideas that might otherwise be quite dry or difficult to explain. If it's got pictures, how can it be threatening? I am really taken with the heading Jill has given this post, too- ways of writing and defining and thinking because it sums up something that I've been skirting around with regards to my project. A multiplicity of voices. Showing the thinking as it's being muddled through and not as a smooth finished document. Jill is right in saying that this kind of writing is very much the opposite of academic writing. I think I am lucky that I am at AIM, where they encourage you to present work in non-traditional formats (as well as being wonderful human beings). I think AIM had the first person graduate with a PhD in multimedia (is this right?) and with an almost entirely online project (Simon Pockley's Flight of Ducks). The Ant and Grumpy Girl are definitely on equal footing (although the balance goes up and down.) I should and will add some more characters and have been thinking about it for a while. I tried doing one with my sister, which I quite liked (and my mother loved) but I felt like I was getting into dodgy territory toing this- it's one thing to semi-fictionalise yourself, it's quite another to do it to someone else. So the ant is a good way around it- he takes on other people's voices without satirising them. I had a look at Mark Bernstein's Where the Hypertexts are and it's got lots and lots of great gleaning material. I also clicked on the link Mark provided in Jill's comments but got an error page but then I think I may have found it here. A hot day yesterday, that ended up horribly windy. Wind... I don't care what anyone says, it's awful. Petite says "It's just so futile". I ended up seeing a fabulous documentary last night The Gleaners and I with La Spinstaire. I was really impressed by it, expecting some heavily moralistic, arthouse number, but getting, instead, a very warm and funny look at people who survive on what other people throw away. The filmaker, Agnes Varda, put a lot of herself into the documentary and this helps to make the doco seem more like a conversation than a lecture. I loved it. It also made me think about the concept of gleaning and, inevitably, how gleaning could be related to blogging- gathering up of titbits of information and gathering them together for the purpose of 'nourishing' the gleaner. Hmm, that sounds a bit lame, I'll have to refine what I'm thinking on this because I'm sure there's something in it. Mark has added some comments about women and technology. He is a technical writer and has also noted the imbalance of the genders in the workplace. I was thinking about it on the way home last night -this fear that a lot of women have about technology (and I count myself in this to a degree, too). I've been pondering on Jill's post all day (Women and Pink). Women and technology- why is it still so unbalanced? I have been thinking about it in relation to my own journey along the technology highway. I know not so many years ago I proudly declared that I "wasn't a computer person" and spouted the old "I'd rather have the hands on experience of using real art materials." I think I also thought that I was too inept to be involved with computers, too stupid. Sometimes I still feel like this, of course. But here I am, 8 years later, not only making my living out of using technology but actually choosing to study it as part of my research. I still don't consider myself to be technologically-minded and find that I often have to ask for help (often on silly stuff, too.) But I have found that I have begun to enjoy the problem-solving aspects of my job as much as the creative aspects and I am getting better at it. All of a sudden, I want to be good at it. I want to be a nerd. There aren't many women in my area at work, and there are no women programmers at all, even though my boss really really wanted to employ one. Why is this? Why did I never want to become a programmer? Because that sounds like maths and that is boring and hard and I wanted to do something creative. Is this what other women think? What about the ones who are good at maths? What happens to them? Is the situation getting better? I hope so, but suspect not. And then there's blogs. I have it in my mind that there are equal numbers of men to women who keep weblogs, but this is probably not true, and is probably influenced by the fact that I read mostly female blogs (not a conscious decision, it's just happened, somehow.) But I think there is something about the format that would appeal to women writers- small, easy, fuss-free. A stereotype, yes, but I wonder if it's true. I've signed up for the women bloggers ring, having clicked on Boynton's link. Why not, after all? erps.... except I've got to fix up the code. It's tomorrow now. Think I've fixed it. I think the thing I like about frequently updated blogs, as I said to Boynton, is the conversational quality they have- ideas appearing in posts as they occur to the writer rather than once they have been all nicely puzzled out and resolved. I like the knots and the subsequent process of untangling. However, as with most things, I think it comes back to the writer's style. Gusset is only updated once a week or so, but I always look forward to it, as she often has a fabulous link to some lovely site and I like her writing. So I declare "long live diversity!" and leap from my podium. It's Meetup time again this week- and I swear that this time I'm really, really going to go. What is this thing called 'blogging'? Sensai sent me a link this morning to an article by Nicole Manktelow in The Age about blogs that I missed last week. (I blog, therefore I am Nov 8th). More also on the "blog as alternative to print medium" which most blog articles seem to cover. I've yet to read an article that looks at blog as research tool (a bit dull for most readers, I guess.) and I guess that for most journalists this is what interests them; that is, how the form affects their own work. Do blogs really pose a threat to mainstream media? I really don't think so, personally. The article raises an interesting issue of blogs and legality- you may feel secure in espousing your views on your anonymous blog but the cover is easily blown. It is also surprising just how many people do stumble across what you've written. Someone once told me that when they wrote their emails they made sure they never wrote anything that couldn't be read over their shoulder and I think this is probably a sensible policy on the whole for blogs. Does put certain constraints on your writing, but then, so does losing your job. O, but I am sore. I am so unfit and inflexible. Must start doing some stretches. Who would have thought that spending every day in front of a computer would make you unfit? I have the day free to work on my proposal. So I've basically done nothing at all on the proposal. Went to see the double at the Astor last night- Badlands and Meanstreets, also with Petite. We liked Badlands very much- excellent script and a chilling, passive performance from Sissy. Meanstreets? Well, it was hard to follow and rather unsatisfying, we thought. No real sense of narrative or plot. We do rather like a good plot. I have hated other films more, though (Breaking the Waves comes to mind, as does Quills) and it is always amusing, if not slightly sad, to see actors you know mostly for their later work looking so frighteningly young. I had a choc top too, which I enjoyed, except for the bits that fell into my lap and refused to be found, choosing instead to melt sullenly into my trousers, wretched chocolate.